Clairvoyance means clear seeing, and is a psychic, or spiritual gift. We are all born with the ability to develop these gifts. Many have them developed already from a very early age, but think everyone else has them too. Psychic powers lay latent in all humans and can be brought to the surface and utilized by anyone who desires this gift, and is willing to take the time to open the third eye. There are some people who think that psychic powers are of the devil, so this hub is only for those who wish to develop or sharpen their skill to see the past, present and future. Clairvoyance can be developed at will. This is a simple method that works but requires patience and determination, which is true of most valuable things. 1. 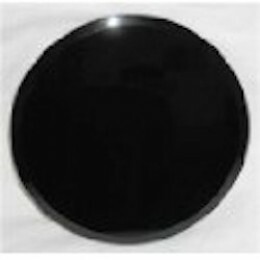 Obtain a small piece of round glass or have one cut. Concave glass is the best. 2. Paint the glass black with a matte shellac. Let it completely dry. 3. Take your mirror somewhere you can be alone and in perfect silence. 4. Relax your mind and body and begin to scry. This simply entails lightly gazing into the black mirror while in a dreamy but extremely aware state. After awhile you will start to see images forming in the mirror. The images may be symbolic of an event soon to occur or they may detail the actual events. Constant use of the mirror will develop clairvoyance. Once it is well developed you will no longer need the mirror. Practicing tells your mind you want to receive this gift of seeing,and therefore, your mind will eventually obey. You have to want it and then begin to look for symbols and messages not only in the mirror but in the world around you. Just as your Television set has been called your “window to the world”, so the Black Mirror,or scrying glass, is your window to the “Psychic World” – the world of the Unknown. Making your personal Black Mirror will take only a few minutes and can open the way to unguessable visions. Sit in an area of no disturbance with the mirror on a low table before you. Reduce the light level until you can barely see your hands. Peer into the Black mirror. soon it will become misty and clouded, then suddenly you will see scenes from other places and other times. Once you have begun seeing these random scenes, you will direct your Black mirror to show the scenes you wish to see. “Mirror, mirror, scry for me. Mirror, mirror, let me see. Every effort must be made on concentrating on what you want to see in the Black Mirror…if used properly it can be very effective, the possibilities are limited, look into the future, read tomorrow’s newspaper…etc. This entry was posted in Articles, Astral Realm, Paranormal, Philosophy, Ritual and tagged abilities, black, clairvoyance, develop, gifts, make, method, mirror, psychic, scrying, simple. Bookmark the permalink.